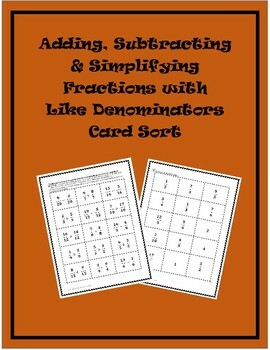 This card match product was created for students to practice adding and subtracting fractions with common denominators and matching the problems to the answers. 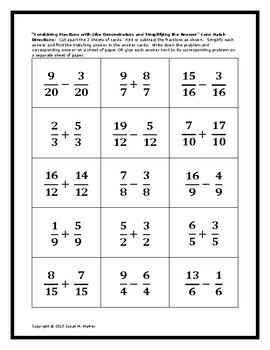 The teacher or student cuts the cards apart, adds or subtracts the fractions as given, simplifies the answers (if necessary), then matches the answers to the answer cards. The answers are in simplified form, and left in improper form when appropriate. The student may write the problems with the corresponding answers on a separate sheet of paper to turn in, or the student may glue the problems next to the answers on a separate sheet of paper. This activity may be completed individually or in pairs or small groups. This product could be used for review exercises and/or at math centers.